Truck drivers are stuck in the middle of the first major battle in Congress over whether self-driving cars and other artificial intelligence-enabled technologies could take away people's jobs. On one side, you have Democrats claiming that rolling out automated trucks too quickly will hurt employment and safety; on the other, Republicans who want to quickly move a legislative package meant to speed up the deployment of self-driving technology. The bigger picture: Truck drivers might be the first set of workers caught in the tug-of-war between old jobs and new technologies. But with Google, Amazon, IBM and numerous other companies staking their future of artificial intelligence, they won't be the last. Why now? : Lawmakers in both chambers of Congress are trying to pass legislation that would let companies test more self-driving cars across the country. A bill that passed the House didn't cover trucks, but Republicans in the Senate want to include commercial vehicles in their bill. Democrats — under pressure from labor unions — don't agree. Unions and their Democratic allies say that if lawmakers move too fast they'll endanger workers — and anyone who uses America's roads. They want legislation to leave the question of trucks to another day. "The consequences for getting this wrong could be deadly both for workers and drivers on the roads," said Ken Hall, from the International Brotherhood of Teamsters, at a Senate Commerce Committee hearing on Wednesday. "And we haven't gotten to the largest issue of them all, the potential impact on the livelihoods and wages of millions of your constituents." Republicans, meanwhile, say legislation should address all types of vehicles at the same time. But they recognize that it's a complicated issue politically. "I think we as policymakers, we in industry, we have to figure out how we're going to answer that question of, 'What's going to happen to me?'" said Colorado Sen. Cory Gardner. "The answer is always — with the innovations that we've been able to achieve in this country — we're going to have progress, innovation and more jobs than we've ever had before. But we've got to be able to say that in a way that is helping people see that, understand that and know that they're going to be OK."
The other coast (and the Midwest): Both Silicon Valley and Detroit are heavily invested in self-driving technology. Alphabet's Waymo, Uber and traditional automakers are all exploring self-driving trucks. Many who are closely watching the industry say they expect the trucking industry to be an early adopter of self-driving vehicles. But an industry representative said Wednesday they're more focused on technologies that can augment drivers rather than automate their roles completely. "Driverless ... that's decades away," said Chris Spear, CEO of the American Trucking Association. What's next? : Lawmaker are at a crossroads. "Well, I'm hoping that we can find a way to work with the Democrats to strike the right balance, you know sort of thread the needle, if you will," said Republican Sen. John Thune, who chairs the Commerce Committee, telling reporters that he hopes to file a bill by the break around Columbus Day. "So we'll see if we can stay on that schedule." Sound smart: This may be seen as a discrete debate over one subset of a technology that's gotten a lot of positive press attention. But it's really an early skirmish in a larger war over the impact the quickening pace of AI development means for Americans' paychecks. 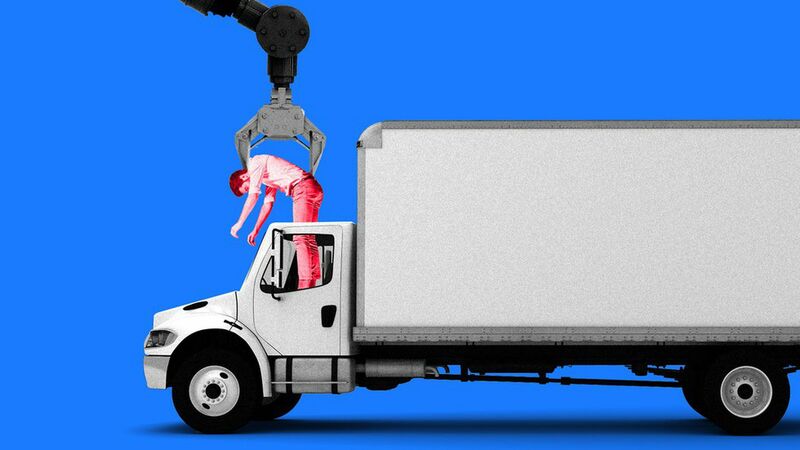 Go deeper: Earlier this year, Axios took a look at places where jobs could be lost when automated trucks are deployed.